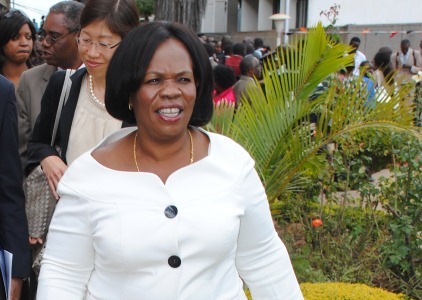 Minister of Chiefs and Traditional Affairs Nkandu Luo suffered verbal abuse in Barotseland when she and her delegation visited the Barotse Royal Establishment (BRE) on 25th October 2014. Nkandu was in the area to find out why BRE boycotted the Golden Jubilee celebrations and also to know why Chief Chiyengele of the Mbunda people was dethroned. On the boycott of Independence Jubilee celebrations, Induna Inete, Tawila Akapelwa Silumbu, explained that BRE realized that it had no role to play according to the Zambian government program. The Induna explained that it was also clear that Barotseland was not recognized as the other territory comprising the present day Zambia. Rhodesia and concessioned areas of Barotseland) and completely ignored the sons and daughters of Barotseland. He told Luo that Barotseland has been erased from the rest of Zambian history, as demonstrated by successive Zambian government regimes. He said the celebration had no bearing on Barotseland, which was in essence about a separate country. He further elaborated that Zambia could not talk about a Golden Jubilee without the Barotseland Agreement 1964 let alone honoring it as the Zambian government had abrogated the Barotseland Agreement 1964 in 1969 while Barotseland accepted this abrogation in 2012, and is currently working to actualize her statehood. He further said the situation was worsened by the fact that the BRE was not even officially invited by the Zambian government. In his contribution, Induna Mutwaleti said that the people of Barotseland have been sidelined, disregarded and disrespected by successive Zambia governments for a long time, yet again clearly demonstrating that it has become a norm for Barotseland not to be regarded as part of Zambia. Consequently, Barotseland decided to finally agree to separate from the rest of Zambia in accordance with the 2012 Barotse National Council resolutions. delegation that people in the jurisdiction of former Chief Chiengele recognized His Majesty King Lubosi Imwiko II as the Head of State of the Kingdom of Barotseland and welcomed the decision of the Kuta in that regard. Mr Kashumba wondered why the Zambian government was still denying the people of Barotseland their right to self- determination, yet they were the ones who abrogated the unity Agreement and worked against it soon after Zambia independence. He reminded President Sata about his failure to honor his campaign promise of honoring the Barotseland Agreement 1964. Others asked the delegation why the Zambian government was building tribal conflict and creating a refuge problem in Barotseland. The Barotse Imilemas (BIs) were also present at the Kuta to show solidarity while chanting slogans ‘Barotseland ki naha (Barotseland is a state/ country)’, Barotseland is not Zambia, and NKandu Luo and her delegation are illegal immigrants in the Kingdom of Barotseland. The people also sang songs praising the Litunga to the effect that the Litunga was for people and, no matter how much the Zambian government attempts to bribe him and his Kuta, He is for the Kingdom of Barotseland. They also sung the Barotse National Anthem and songs praising the BNFA Chairperson General, Hon. Clement W. Sinyinda. The gathering got to a point where some of the youths started shouting some unpalatables to a point where Hon. Luo could not hold back her tears. It is reported that after her gruesome experience at the Kuta, she was given an opportunity to pay a courtesy call on His Royal Majesty the Litunga, where she failed to hide her emotions and sobbed in front of His Majesty.